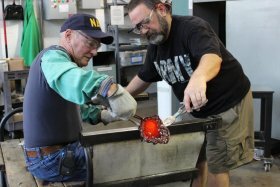 In recognition of those who have served our country, we’d like to show our gratitude by offering veterans and active military the opportunity to participate in a FREE one-hour Introduction to Glassworking lesson on November 10 and 11. These free, one-hour classes are available on a first-come, first-serve basis. Pre-registration is required and space is limited. Registration opens October 1. For more information or to register, call +1 (607) 438-5800 or email Fun with Glass at funwithglass@cmog.org.